The five main sections of this half hour talk - the first to be developed for the virtual academy on transforming our food systems - cover the basics of the food system, the various actors operating in it, the changing world and key trends, the varying tools for control used, food policy and practice. "Building upon The Food System: A Guide--which Tansey co-authored with Tony Worsley in 1995--this video provides a succinct overview of food in our world today, critically analysing the dynamics of our global food system and identifying key issues for discussion. The video will be an invaluable tool for educators wishing to prompt reflection and debate among students and to foster the kinds of debate necessary to reshaping the future of food." says Harry G. West, Professor of Anthropology and Chair of the Food Studies Centre,SOAS, University of London. These issues are covered in more depth in the book, which is still a 'an indispensable reference point for students of food policy", says David Barling, Reader in Food Policy, Centre for Food Policy, City University, London. The running order for the video is given below. This video is a public good, open education resource that is unrestricted in non-commercial use (for commercial purposes or in commercial organisations permission is needed). If in doubt please contact me. Please respond to the survey as this feedback will help in taking this 'virtual academy' work further. Suggestions for further materials to be linked to this page or added to this series are also welcome. If you want to arrange for follow-up discussions with me via the internet – over Skype or some other service - after using the talk in a class, please contact me. There are also huge numbers of website of relevance, here's just a couple to start with. A first version of this video was shown at a workshop at the University of Waterloo, Ontario, Canada on 18 April 2013 with potential prime users. Feedback from there and others who saw the first version helped in production of a pilot version that was uploaded in July 2013. That version has been viewed by several hundred viewers and used in a number of courses. I have taken part in Skype Q&A's with students in Canada, Denmark and the UK following these uses. This version has been re-edited to fit the format developed for the 'vitural academy' on transforming our food systems, on which I am currently working. It and the other talks will be hosted on a dedicated site in due course. "I would use this for the online course I am teaching at St. Lawrence College in Ontario, Canada. I would use this in classrooms as well." "I teach a second-year undergraduate course on food and culture. This is a great video to demonstrate the complexity of the food systems. I will certainly use it on a reading list. It will be required viewing." "This video hits the right balance – being both a comprehensive yet concise introduction to the global dynamics and complexities of food systems, that would serve as a fine base for upper-level undergraduate or introductory graduate-level courses. While particularly appropriate for courses focused on food and food systems, this video would also be fantastic as a synopsis of food systems in a course looking at environmental / resource governance, or questions of ‘sustainability’ more broadly"
"I teach our 2nd semester Integrated Food Studies MSc at Aalborg University Copenhagen course on food governance. 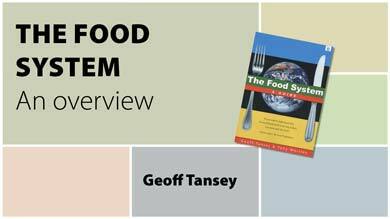 I use the virtual academy's "Food Systems – an overview" as an introduction to our course. The video is a great introduction to what we mean by food systems and why we need to think in systems. Because the course mainly centers around governance – so the lecture’s finale on tools for control is highly pertinent and a great point of entry for our discussions on food governance. Looking forward to seeing the virtual academy developed." Robert Pederson, Research Fellow. Susan Turner: "It is a rare opportunity to connect with an individual whose works we are reading (or viewing) and discussing. I appreciated the chance to formulate questions and responses to your talk Your openness to engage with us by connecting over Skype, responding to our questions, asking us a few questions, and seeking our feedback was refreshing and appreciated... "
Lisa Cressman: "Being able to hear from Geoff live was quite beneficial and something I have not experienced in other classes. It was interesting to have a talk from him that was catered to our group, as it was our questions he was answering... Overall, I thought it was a beneficial experience and a method that could be used in the future!" Samantha Davies: "I would say that this type of communication between the class room and an author is incredible! By having a personal conversation via skype makes the readings more interesting and come to life, and being able to ask questions is even more effective coming from the author themselves."